Translating its success as an online community and with the express purpose of providing the Indian motorcycling milieu a larger, more concrete and stronger platform in the print media, xBhp launched a bi-monthly magazine on September 27, 2010, starting with its October 2010 inaugural issue. The magazine has been created around the theme ‘I, the Biker’ and puts the motorcyclist ahead of the motorcycle in context. This magazine has evolved from a long process of development and focuses on elevating motorcycling from a necessity driven activity to a lifestyle choice. It provides content that puts forth motorcycling in its full wholesome avatar and delves into travel on bikes, safe riding practices and emphasizing that motorcycling is as much a cerebral activity as it is a physical one. The xBhp magazine is a print analogue to a democratic tool that’s for, by and about the Indian motorcyclist. For the motorcycling community of India, this magazine is a means of spreading its message of safe, responsible and fun motorcycling. With the ultimate aim of truly globalizing the Indian motorcyclist, xBhp has taken this small step in the print world. A step that we firmly believe will turn out to be a giant leap for the entire two-wheeler fraternity of this nation. The key differentiators of this magazine will be its focus on people, travel on motorcycles, high quality of photos, minimum syndicated content and most importantly the flavour of freedom and youth. In this issue of the xBhp Magazine, we visit Dubai again but this time around our fleet includes a Ferrari Portofino along with a Ducati Panigale V4 and a Ferrari GTC4 Lusso along with a Ducati xDiavel, a Duabi Dream run. In addition to that we took two BMWs, the BMW G 310 R and BMW G 310 GS to the treacherous terrain of the Spiti Valley. In this issue we also show you how bikers go shopping in #xTraShoppingHorsepower. You will also see how we celebrated women’s day by inviting some female motorcyclists to the xBhp HQ in #xBhpTalks. This issue also contains the first ride reviews of two new motorcycles, the 2019 Bajaj Dominar and Yamaha MT-15. From 0-100 Motorcycles, we have the Ducati GT1000 and the Triumph Tiger 70. 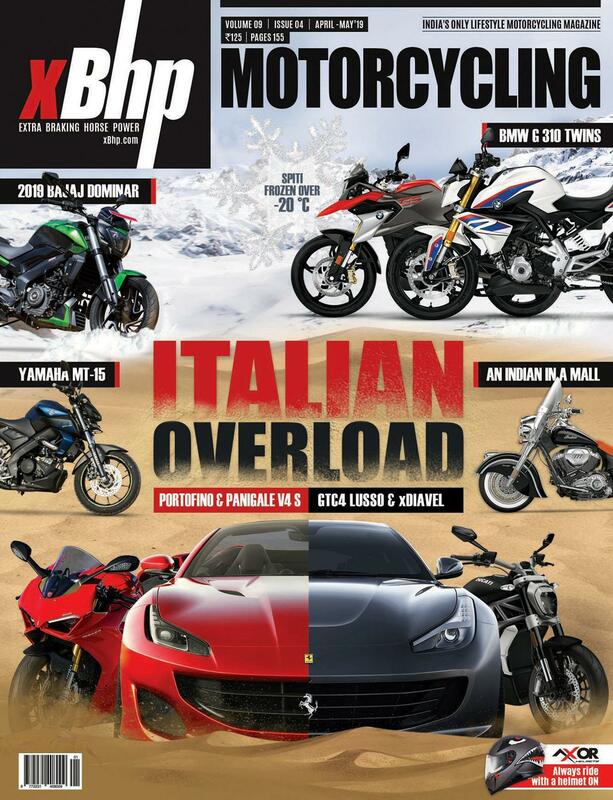 You can buy the xBhp magazine from hundreds of news stands, airports, railway stations and bookshops around India. You can also procure it’s digital edition on Apple Newsstand or for your Android Device! You can also order the magazine right at your doorstep!